One Super Bowl 53 prop bet just got a whole lot more soulful. On Thursday, betting odds on the length of time it takes Gladys Knight to sing the Super Bowl 53 national anthem were released shortly after the NFL announced she would be performing the song at this year’s game. Each year, the national anthem is one of the most popular Super Bowl prop bets available to bettors and sportsbooks will set an over/under on how long it will take the performer to sing their rendition. After doing some research, this is the only rendition of the national anthem by Gladys Knight we could find. We clocked her national anthem time in the video at 1 minute and 32 seconds, but it’s difficult to pinpoint exactly when she stops singing due to the crowd noise. Even if she is still singing for a few more seconds, it still clocks in well under the BetOnline time of 1 minute and 50 seconds. Unfortunately, there’s a lot of unknown variables at play here, such as: What event is this from? Why is there no footage? Is that even Gladys Knight singing? It seems to be her, but there is no way to 100 percent sure at the moment. And you have to consider this rendition was performed in 1991, and that’s her singing 28 years ago (she’s 74 now). It’s probably best to not put too much stock into this lone recording of her singing the national anthem. But to help assist you with this prop bet, we’ve also included the length of time it took the past 13 performers to sing the national anthem at the Super Bowl. The average time comes to 1 minute and 58 seconds (118 seconds) after rounding up. Last year, the over/under for P!nk was set at exactly 2 minutes by most sportsbooks and once news came out about her having the flu, bettors were quick to adjust their wagers accordingly. Typically the time is set close to two minutes, but this year’s over/under of 1 minute and 50 seconds is rather low, especially since only two of the performances (Billy Joel and Kelly Clarkson) would fall under the total. If it was set to a more traditional two-minute mark, then the over would be 7-6. This year’s prop bet is rather tricky, and bettors have roughly two and a half weeks to predict the duration of this year’s national anthem. Regardless of the outcome, one thing is certain: When Gladys Knight steps up to the mic to sing the national anthem at Super Bowl 53 in her hometown of Atlanta, bettors all over the world will pull out their stopwatch (or use an app on their phone since it is 2019 after all) to measure the amount of time it takes her to sing the national anthem. 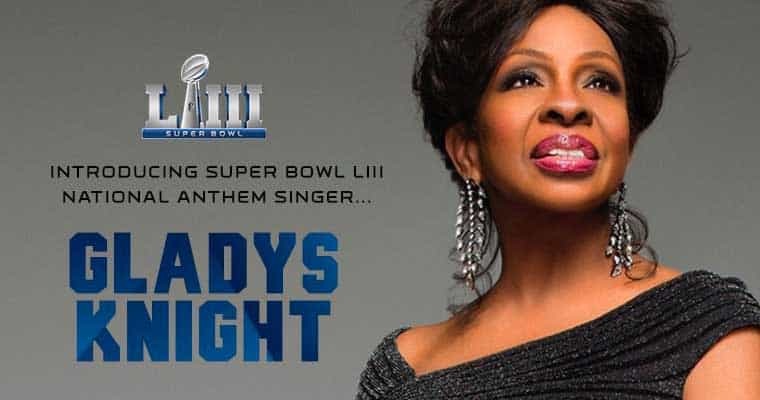 The national anthem for Super Bowl LIII will be performed by Gladys Knight shortly before the 6:30 p.m. ET kickoff time on Sunday, February 3, 2019, at Mercedes-Benz Stadium in Atlanta, Georgia.